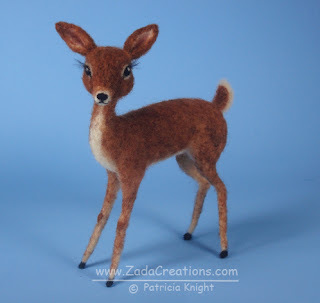 Just listed my newest creation a needle felted Vintage Style Deer. She's approximately 4 inches by 5 inches. 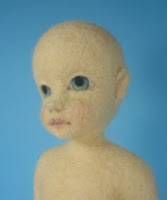 She is needle sculpted with close attention to detail using Alpaca, Romney, Corriedale, Norwegian C1, and Merino wools. 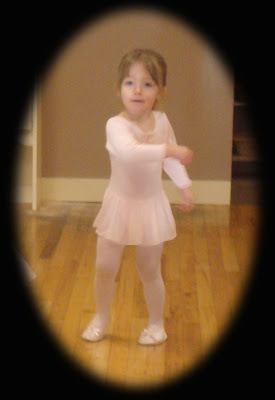 She is wired to give movement and different posing options. She is available now on Ebay: Link Thanks for looking! I'm getting closer to completion on my Haflinger! Yeah! 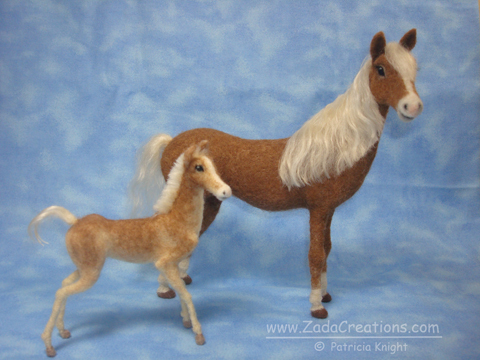 This is a special creation to me as it reminds me of visiting the horse barns every year at the County Fair. That is where I first fell in love with the Haflinger horses and I have visited them there almost every year scince childhood. 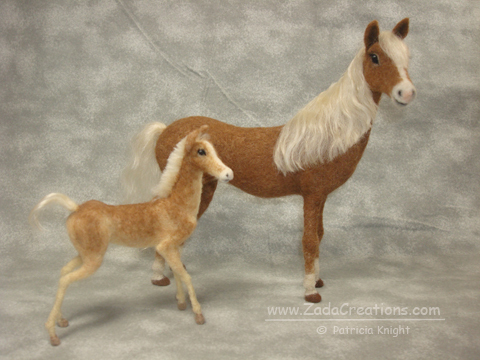 They inspire me with their elegant long flowing blonde manes and tails. They are so beautiful! With this little deer I wanted to challenge myself and see how tiny I could make her. 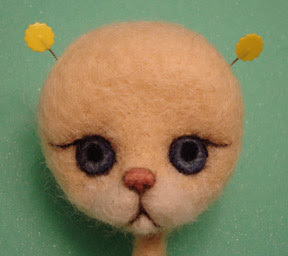 At 2 inches this is by far the smallest deer I've ever needle felted! I want her to have all the detailing and character of the larger deer I have made. I've already broken three needles while trying to sculpt in all the little details - teeny, tiny, muscles and joints - frustrating - but I'm not giving up! 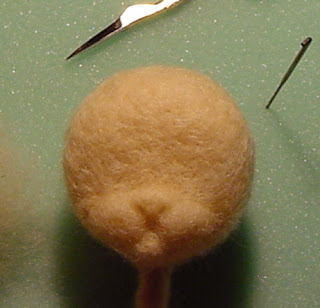 Rudolph is 8.5 inches and needle felted of Romney, Merino, and Alpaca. Click here to see his Ebay Auction. Holly is ready to bring in some Holiday Cheer! She is 6 inches sitting and 8 inches standing. 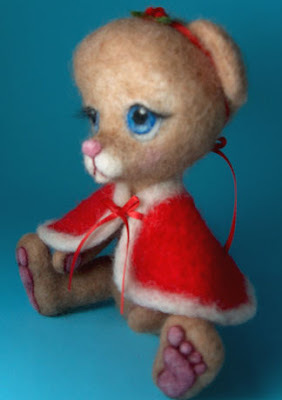 All of her colored details are 100% wool with the exception of her red ribbon bows. You can see more photos and read more about her on Ebay. Times have been full of fiber fun! Some of my creations were chosen for a Fiber Art Exhibit that ran at the Bellingham Public Library October 01 through November 10. It was an honor and a thrill to see my work displayed there! The Whatcom Weavers Guild hosts an Annual Fibers and Beyond Show and Sale at the Hampton Inn, Fox Hall every Fall. I was happy to be a part of this years Show. I was able to meet the most wonderful and talented Fiber Artists. To top it off the Sale was a great success and I sold more than I had anticipated and made some wonderful connections. I look forward to participating next Fall! 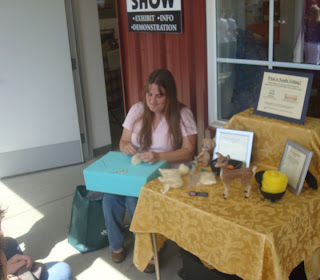 What a wonderful time I had giving the Needle Felting Demonstration at the State Fair. I really enjoy sharing my enthusiasm for needle felting with others! Thanks to all those that stopped by and joined in! 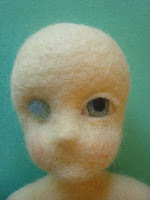 Wool Show Needle Felted Girl & Work In Progress Photos! 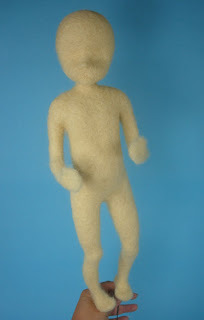 Sarah is 100% wool with the exception of her wire and stand. I enjoy the challenge of doing all the shading and details out of wool! She stands at approximately 18 inches tall. Here are some of her work in progress photos. I hope you enjoy seeing them! Recently I recieved a most precious gift from Artist Donna Armstrong. She painted a gorgeous picture of ginger on a gold velvet lined box that I will treasure forever! Donna has been painting scince the late 1970's and in the last couple of years has started a line of fabulous painted boxes. 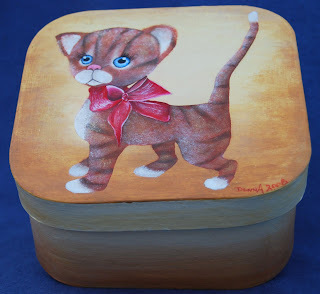 Her painted boxes range from 3 to 12 inches and come in lots of styles and shapes! Her boxes incorporate many painting techniques. She has boxes available of her own original artwork or you can commission a custom painted box! Click here to check out her website and see more examples of her hand painted treasures! 2008 Golden Teddy Award Nomination! Ginger has been nominated for the 2008 Golden Teddy Award! Such a great honor and I am very excited! 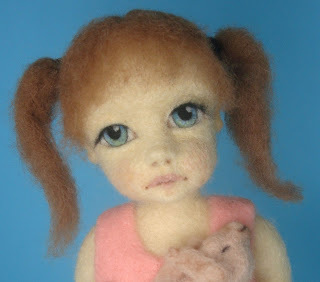 Here is a link to the full list of wonderful Nominees and a link to the 2008 Doll & Teddy Expo. I was delighted to be chosen as February Artist of the Month for Thread Animals. You can see a copy of my AOM interview by clicking on the above Thread Animals Blog link. 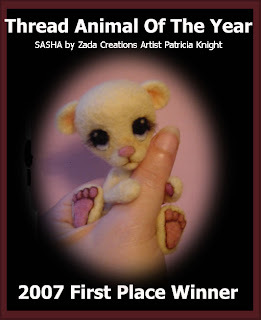 I'm very excited that "Sasha" was voted Thread Animal Of The Year for 2007. 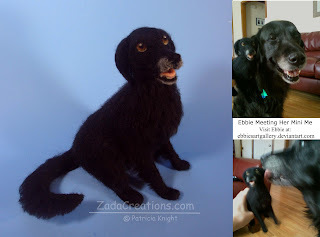 Threadanimals is a fun Yahoo group of over 1000 members who teach, learn, share and enjoy the world of thread and needle felted animals. 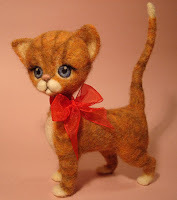 "Ginger" the little tabby kitten is finished! Her final measurements are 6 x 6 1/2 inches. Ginger and I have grown quite attached and even though she will be hard to part with I have listed her on Ebay. You can visit her there and see more pictures of her by clicking on the link below. I have just been tagged by my very talented Artist friend Diane MacNaughtan! Diane creates a magical world of whimsy with her Artist Ornaments which she sells out of her studio The Mcollection. This means I am to write five random things about myself, then tag five others to do the same . . . I am a peanut butter nut!! I crave and devour anything with peanut butter!! I used to do "Pet Therapy" and take shelter animals for visits to people in Nursing Homes. A great win-win situation for both the lonley people and animals enjoyed the company! I have mandibular fibrious dysplasia. I secretly dream of being a writer. My favorite place to be is at home. . . enjoying time with my family or working on a project in my studio. Link to your Tagger. This is a wonderful PR tool for the GOOGLE search engines. HENCE THE NAME TAGGED! Share 5 facts about yourself on your Blog. Some facts can be random & some unusual. Sharing on Tagger's Blog is optional. Tag 5 people at the end of your post by leaving their names as well as links to their Blogs. This took a little longer to get posted than I would have liked. I had a computer crash and haven't been able to get online until now. Sure am glad to have my computer back up and running! So here she is with her new fur coat. I tried several color variations and decided on an orange tabby cat. I feel these color tones bring out her blue eyes nicely. I spent a lot of time mixing these colors they include reds, oranges, yellows, browns, and cream wools. I still have a little more details to add to the face and ears and of course she'll get eyelashes! Well, off to finish this little girls body! Here is an update Work In Progress for the cat. Her facial features are more defined. I will come back and do more work to the face, but for now it's time for this kitty to get some fur! I have some wool colorations in mind, I'll work a couple and see what I like best. She should look very different on the next update with her new fur coat!! 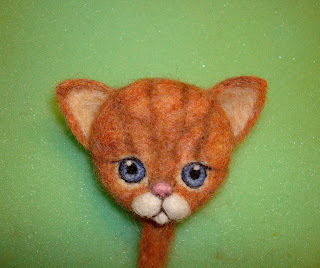 Here is the cat I started needle felting today. She is just a little head and her facial features are just starting to emerge .... this is my favorite part .... as she evolves.... and her little personality is born.... I thought it would be fun to do some pictures of her Work in Progress. I'll post more as she grows..... Now, I better get back to work!! Great Day at the Fiber Festival!! I had the great privilege of demonstrating Needle Felting during the Fiber Festival at Lost River Alpaca's Farm and Country Store. What a wonderful day it was despite the windy weather! I got to meet the most wonderful Visitor's and Fiber Artist's. Thank you to all those who took the time to stop by and see me and ask questions! And thank you to Linda for hosting such a great event. If you are in the area be sure to visit Linda at Lost River Alpaca's, 601 West 3rd Street, Nooksack, Wa. She has a beautiful farm and wonderful store full of fabulous fibers and goodies! 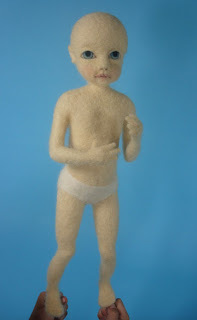 Needle Felted Sculpture takes BEST OF SHOW Award!! Here she is on display at the Show with all her ribbons! I am honored and thrilled beyond words and the excitment of the moment is sure to stay with me for a long time to come! 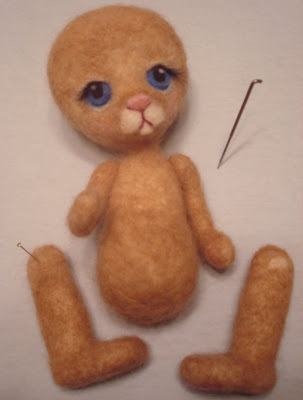 Needle Felted Bear Featured in the Newspaper! My little needle felted bear got a big picture of her printed in the Bellingham Herald Newspaper! 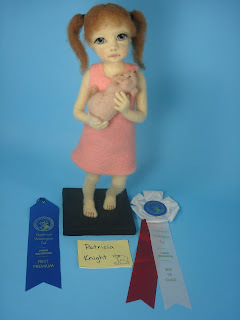 She was featured as a Unique Blue Ribbon winning creation. What a thrill it was open the newspaper and see her little face looking back at me! Here she is reading her article! That's a big picture for such a tiny little bear! The little bear stands at only 3 1/2 inches tall yet they blew up and printed her picture at 6 1/2 by 8 1/2 inches! I have finally found the time to create a blog! Trying to figure my way through here, but I am excited to be on my new blogging adventure. 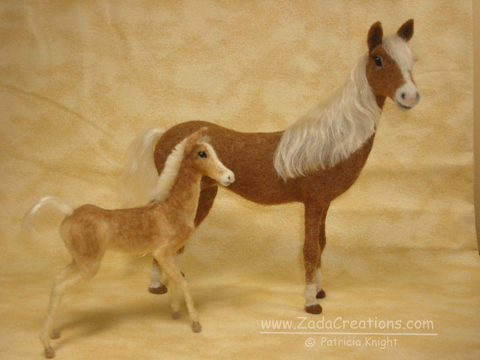 There's been a lot of exciting things happening with Zada Creations and I can't wait to share!